Here’s your SpinSheet Racing Roundup for July 22-23, complete with stormy weather and racing fun. Before we get started, a word on the racing roundup and how it works. We here at SpinSheet have a small staff and try our best to get out to and cover as many events as possible… as for the rest, we rely on YOU, our readers, to supply us with information, stories, and photos. If you find that your club’s events are not getting into this web post or into the magazine, it’s highly likely you’re not sending us news. Please do! Whereas we don’t have the manpower to cover every 10-boat regatta on the Bay, we certainly want to hear about anything you host that’s significant to you & your club. Send notes, reminders, and photos anytime to [email protected], and we’re happy to include your events. Tuesday’s exciting final set of races on Chesapeake Bay put the finishing touches on a fun and eventful 2017 U.S. Junior Women’s Doublehanded Championship. 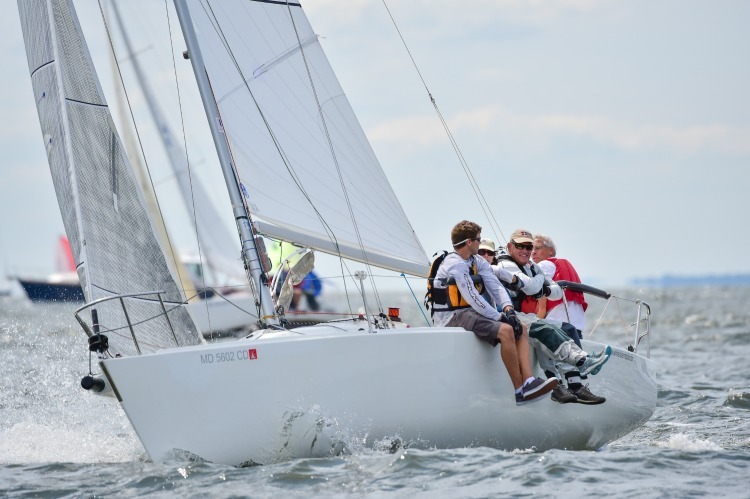 Thirty-five highly skilled young doublehanded teams from around the country convened in Annapolis, a city rich in sailing, for three days of great competition and two days of clinics in the Club 420 with top-notch coaching and instruction. There are teams from 14 different U.S. states in competition at this championship, who represented their home yacht club or sailing organization. The returning champions from the 2016 event in Mississippi, Sarah Burn (Short Hills, N.J.) and Patricia Gerli (Greenwich, Conn.), joined this year’s fleet for a chance to defend the historic Ida Lewis Trophy. Burn and Gerli were challenged considerably throughout the championship, especially by local standouts Maddie Hawkins (Edgewater, Md.) and Kimmie Leonard (Annapolis, Md.). Hawkins and Leonard dominated the first half of the regatta, while Burn and Gerli were the more dominant team over the final four races. After a slow beginning to the championship on Sunday, which included only one race due to light wind, the regatta picked up the pace with four races on Monday and three on Tuesday. Hawkins and Leonard had a three point lead over Burn and Gerli going into the final race of the championship on Tuesday afternoon. Burn and Gerli’s throw-out score was a 13 versus Hawkins and Leonard’s 4. Burn and Gerli won race eight, but Hawkins and Leonard stayed close and placed second to win the championship by two points. This was Hawkins’ first Ida Lewis event and Leonard’s second. With another skipper, Leonard placed 26th at the U.S. Junior Women’s Doublehanded Championship in 2014, hosted by American Yacht Club in Rye, N.Y. Skill development and high-level coaching is an important part of the experience for the participating sailors (ages 13-18). Teams participated in a two-day clinic in the Club 420 on Friday and Saturday. The clinic was led by a number of top sailing coaches from around the country. Speaking of SSA, congratulations are in order for SSA member Jake Vickers for placing second of 38 at the Laser Class U.S. Nationals and U.S. Singlehanded Sailing Championship in Lake Tahoe. SITELLA, RUMBLE, RESTLESS and TEMPO win fleets in Moonlight Triangle. Thirty-one (31) boats were at the starting line for the Cruising Club of Virginia (CCV) annual summer evening race in the Bay. Thunderstorms and the resulting turbulent conditions drove ten (10) to retire from the race before finishing. The PHRF A and B classes sailed a 21.7nm course and were buffeted by two boomers before dark. The remaining classes sailed a 14.8nm course. PHRF A (12 boats): 1.Ian Hill, Sitella; 2.Jim Bordeaux; Solstice; 3.Craig Wright, Afterthought. 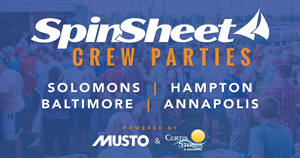 PHRF B (11 boats): 1.Ben Weeks and Michele Cochran, Rumble; 2.Rusty Burshell, Cool Change; 3.Andy Armstrong, Bluejacket. PHRF C: only one boat sailed the course,Ben Cuker, Callinectes. PHRF Non Spin (5 boats): 1.Jay Thompson, Restless; 2.John Edwards, Recovery; 3.Alan Johnson, Seeker. Cruising (2 boats) 1.Jonathan Romero, Tempo. Principal Race Officer: Richard Payne. Official Scorer: John Ritter. Didn't see your event listed in SpinSheet's Racing Roundup this week? Send us a note. We'll add it in or mention it next week. A photo is always helpful. Thank you!